Breaking old conventions, inventing new instruments, replacing polyphony with a keyboard or lute, composing chromatic music and reinterpreting the ancient Greeks: the masters of music in the 16th century created an innovative style, including opera, that shortly after would influence instrumental music and that would be called “stravagante”.“Prima prattica” or “stilo antico” are terms that represent the polyphonic Flemish school, that was spread over whole Europe and the New Spain. The new style is rooted as well in the North as in the South of Europe, but finds its most expressive form in the Republic of Venice, where the Basilica di San Marco houses many singers and instrumentalists of all sorts. Together with the quest for new sounds an instrument rises, that will soon be ousting out the cornetto as being the principal soprano instrument: the violin, soprano of a family of instruments that will later form the string orchestra. Even while the influence of the new style is big in whole Europe, the old school does not die out or is replaced. Different courts and churches maintain the classical polyphonic school and the tradition of playing instruments like the dulcian and the cornetto, which were already in the beginning of the 18th century regarded as being old fashioned. 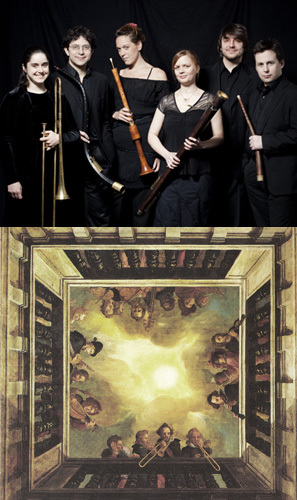 I Fedeli presents a programme, that illustrates that change of style, with instrumental music from around 1600. With the instrumentation of winds, violin and organ those two styles prominent in the beginning of the baroque era are combined. The programme includes works by A. Willaert, C. Rore, G.P. Palestrina, A.Gabrieli, G.Gabrieli, T.Merula, G.M. Fontana, B. Marini and A. Bertali.